Seven albums in their storied career, Irish folk/black metal horde Primordial still don’t seem content to rest on their laurels and bask in their achievement, that most bands only wish they could realize. No, instead they continue to grow and morph into a new version of themselves, and what listeners will find on Redemption at the Puritan’s Hand won’t necessarily surprise them but will keep them more than captivated for a new journey. Frontman Alan “Nemtheanga” Averill said their new opus is their “death album.” That doesn’t mean death metal, in case you’re wondering, but the end of something. Life, basically. So it’s dark, foreboding, threatening and, at times, hopeless, yet there are instances on Redemption when the slightest glimmer of hope shines through. And no, any redemption isn’t actually at the hands of a Puritan – tongues clearly were in cheeks when that was coined – but it’s more at one’s own hands. There’s a clear theme, as with most Primordial records, of being true to oneself and one’s own beliefs and, even if death is the result, not selling out to pressure. The song Bloodied Yet Unbowed, one of the most passionate on the new album, tells that sort of tale. Losing to a supposed “better man” but actually coming out on top because no personal morals were sacrificed. And, there’s something to be learned from defeat, and while the head can be hung afterward, what’s culled from that experience can lead to triumphs in the future. A similar sentiment can be found on Lain With the Wolf, another surging epic that borrows from power and pure classic heavy metal, as Averill spends the time wondering if he’ll be consumed by his demons or if he’ll confront and conquer them. Sure, the way the lyrics are structured, it sounds a little rustic, but the themes are easily applicable to just about anyone’s life. It’s one of the many reasons Primordial’s fans are so devoted to the band because, even though they often spin yarns that would sound just right being read off dusty, yellowed old pages, the themes spread across all eras. We’ve covered the themes, but most probably wonder how the record sounds. Well, anyone who’s been on board for the entire Primordial story, from their 1995 debut Imrama until now, knows they started as a fairly sooty, grisly black metal band with shades of folk that slowly got less savage from a tempo standpoint. They’ve poured more folk and more power metal into their repertoire to now, where the black metal moments -- God’s Old Snake, ”The Black Hundred -- are the exception and not the rule. Their albums always hold that measure of change, and this is no different. But what they now lack in black metal aesthetics, they make up for in heartfelt, charging emotion. Listen to a song such as dark ballad The Mouth of Judas or tidal waving closer Death of the Gods, where that theme of ultimate demise pokes you right in the nose when Averill warns, “Beware of the thing that is coming,” and try to deny being moved. You can’t do it. This band has grown and matured as organically as any other act, and their music is as vital as ever. Those who long for their early days may not find anything to warm their souls, but chances are if you’re in that camp, you tuned out long ago. 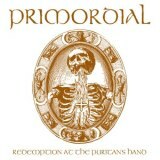 Those who appreciate Primordial as one of metal’s most important yet underappreciated storytellers will find yet another collection to keep you roused until these dark warriors come around again.